Dubbed "Zephyr," the prototype High Altitude Long Endurance (Hale) flydroid airframe is made of ultra-lightweight carbon-fibre, allowing it to have an 18 metre wingspan but weigh just 30 kg. It's powered by amorphous silicon arrays "no thicker than sheets of paper". Attack of the fifty-foot electroplane. Apparently the potentially record-breaking flight was to a maximum altitude of 58,355 feet, and the Zephyr was able to carry "a surveillance payload" throughout. The tests were carried out at the US military's White Sands Missile Range in New Mexico. 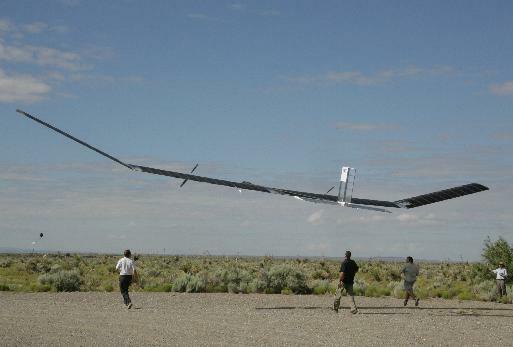 “The possibilities suggested by unmanned flight are truly exciting," said Qinetiq's Zephyr boss, Paul Davey. Though Qientiq suggests that Zephyr or its like could be handy for various civil applications, there isn't much doubt that they're primarily looking towards a military customer base. Hale is a particular aspiration of the US Army, which would like to have spy platforms and comms relays that could lurk at 50,000-feet-plus for long periods, perhaps freeing the soldiery from dependence on planes and satellites. By the sound of it, Zephyr can lift a payload; but one might reasonably speculate that it won't have much power to spare. Most surveillance packages need a fair bit of juice, and some - such as synthetic aperture radar - need quite a lot. Even communications relay could be a bit demanding, especially given that the Zephyr needs to husband every erg so as to stay aloft through the night. Qinetiq says that the solar-powered plane has comfortably beaten the world unmanned-aircraft endurance record, previously held by Northrop Grumman's Global Hawk. However, Federation Aeronautique Internationale (FAI) officials weren't present at White Sands, so the Zephyr flight "may not stand as an official world record."